The Newest Rant: Today's ToyMan Show was Fantastic Yet Again! 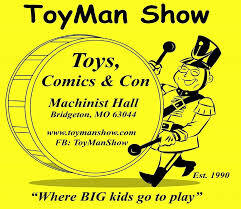 I have now often written about the Toyman shows put on Chris, "Toyman," McQuillen. They continue to be amazing fun and always have awesome stuff to purchase. I was sure to come by again today bright and early (although Daylight Savings slowed me down). First I said hello to my chums at The Comic Grind bus outside the show before I headed in to do some buying! It may have been cold and the dreaded morning after we, "Spring Forward," and lose an hour of sleep, but the show was still packed with folk worth chatting with about toys and comics as well as awesome vendors such as the good folk at STL Comics, Wayne Kent Comics, and Toys of Our Youth--all vendors I highly recommend buying from. I realized something today as well. While the Toyman shows often have guests, I don't usually discuss them--which is unfair to the ToyMan shows as they get some cool folk! For example at this show there were special guests such as artist and actor Tim Proctor as well as actor and former WCW Wrestler Bishop Stevens. Tim Proctor and Bishop Stevens. Both have been on shows such as, "The Walking Dead," and they were very friendly and eager to speak with attendees. They also were kind enough to pose for a photo together for the blog. In addition, I ran into a member of the professional cosplay group, Curvy Kitty Cosplay, who was super nice and excited to discuss cosplay! Toyman shows often get actors, comic-creators, cosplayers, and more, so I should really make sure I mention the guests too as I don't want to short-change all the awesome stuff at Toyman and just talk about the vendors--although as always there were plenty of superb vendors! 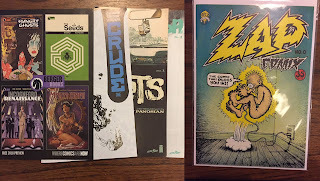 For my pick-ups at the show, I was able to acquire some assorted newer Ashcans for a variety of comics series at a good price as well as an old first-printing of, "Zap Comix #0," which is a fascinating piece of history for anyone interested in R. Crumb and underground comic-books. 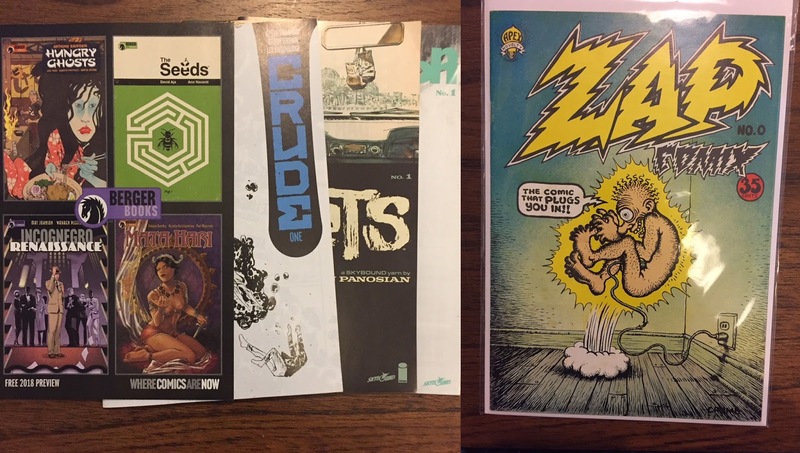 I also got some random dollar comics that caught my eye and I was going to buy a Funko Pop of Bullseye, the Target mascot, but I decided to browse a bit more first and by the time I walked back to the vendor it had been sold--yet more proof that the old saying is right how the time to buy something is when you see it! Today at the Toyman Show I had a delightful time meeting guests, shopping, and just enjoying looking at all the assorted wares from comics, to Funko Pops, die-cast cars, dolls, and much, much more. The Toyman show is always a good time and I encourage everyone to come to one sometime! The next Toyman event will be on May 6th and you can visit the website here to learn more.